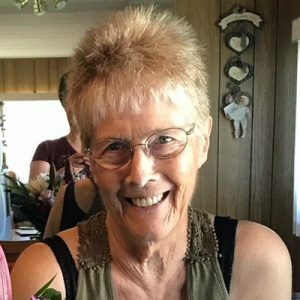 On Wednesday September 5, 2018, Evelyn Vivian Mackay (nee Beattie) passed away peacefully at Kelowna General Hospital in the presence of her family. Evelyn is survived by her daughters, Wendy Prebble (Raymond), Donna Fazan (Danny) and Sandi Fazan (John). She is also survived by her sisters Grace Bacon (Don) and Marg Ford, and brother Ralph Beattie (Pauline). She is predeceased by her brother Frank Beattie (Audrey). Evelyn was born November 23, 1943 in Kelowna, BC, and lived there all her life. Evelyn had a passion for gardening, knitting and making jams and jellies, which she often sold at flea markets and bazaars. She was known for her quick wit and sense of humour, and her generous nature. There will be a Memorial Service for Evelyn on Saturday September 15, 2018 at 1:00 pm at the Rutland Centennial Hall located at 180 Rutland Road North, Kelowna, BC. The service for MACKAY, Evelyn Vivian (nee Beattie) is scheduled for Saturday, September 15, 2018 at 1:00 pm . Below you will find the map for the service location and the contact information should you have any questions. I am truly sorry for your loss. Your Mom was a gem. So many great memories growing up with you girls and “Auntie Ev”. Donna ,Sandy & Wendy. So sorry for the loss of your mom…hope you find love & and comfort in all the great memories and love & laughter you all shared! Will miss her smiling face!